Ddistribution of bottled, canned or boxed products such as food, medicine, beverage, cosmetics, detergents, seasonings, dairy products, tobacco, etc. 1. Able to combine with other equipment to make a whole production line for continuous or intermittent automatic weighing and packaging. 2. Variable Frequency Drive (VFD) to adjust conveying speed for less energy consumption and lower cost. 3. 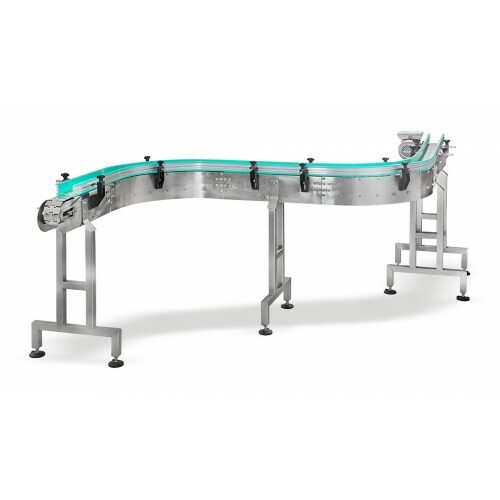 Able to meet single row conveying requirement for beverage labeling, can filling or cleaning as well as to meet high conveyance demand for sterilization machine, bottle storage table and bottle cooling machine. 4. 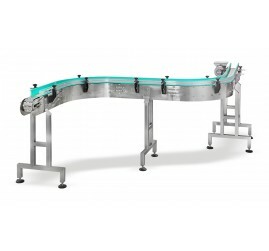 Able to connect both ends of two steel chain conveyors to make an overlapping combination chain so that the bottles / cans are conveyed in a dynamic transitional state, leaving no bottles or cans on the conveyor and making empty or stuffed bottles or cans move smoothly through the conveying line. 5. Simple maintenance, easy disassembly and convenient for cleaning.